With the Terps losing a bevy of their top contributors from last season, and others who had an impact as well, the 2019 roster includes a lot of new faces. A large freshman class will help to fill the holes, but head coach Rob Vaughn and his staff also brought in a multitude of transfers to help the Terrapins this season. Let’s meet them all. Aside from his great name, Tucker is a big left-hander who stands at 6-foot-4. A Texas native, Tucker originally committed to Texas Tech out of high school but never appeared in a game for the Red Raiders. He instead pitched at two different junior colleges — San Jacinto and New Mexico — over the past two seasons. He has worked as a a starter and a reliever, and struck out 23 batters in just under 26 innings in the Ripken League this summer. 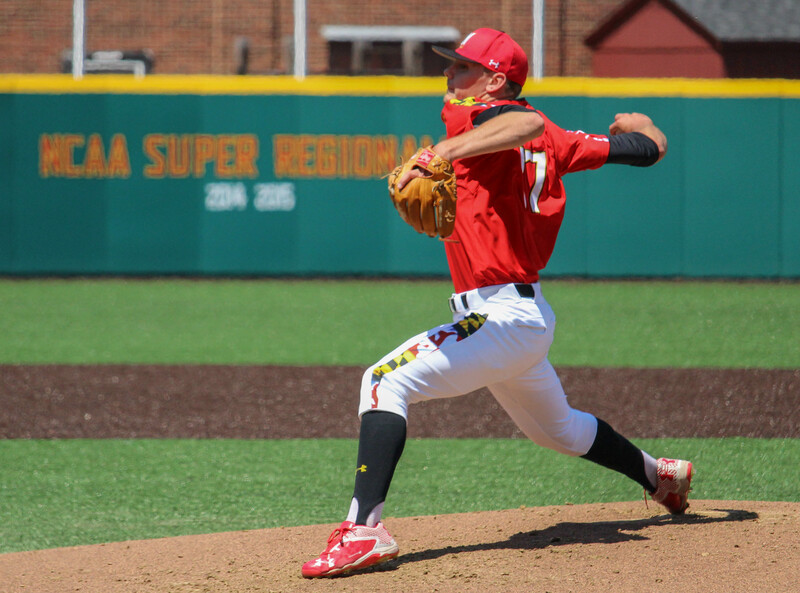 Thompson spent all of 2018 with the Terps, but had to sit out the season after transferring from the Division-III level, where he pitched one season at St. Mary’s College of Maryland. His fastball moves well and he has a good chance to win a weekend rotation spot this season. Thompson had a great summer in the NECBL, posting a 3.08 ERA in just under 47 innings of work. Turnbull is a tall right-hander who could find himself in some high-leverage situations for the Terrapins this season. He has one of the top fastball velocities on the team this year with a pretty good breaking ball that helped him strike out 15 batters in nine relief appearances this summer in the Ripken League. He comes to Maryland from Harford Community College where he saw time as a starter and a reliever. Walls will compete to see time in a wide-open outfield this season, and he has a bat that could keep him in the Terps lineup. The 5-foot-10 left-handed hitter batted .385 with a .477 on-base percentage last season at Pasco-Hernando State College in Florida. That was his only season at PHSC, as he transferred there after originally committing to George Mason out of high school and playing there for one season in 2016. The man they call “Sea bass” comes to College Park after he played two seasons at Ellsworth Community College in Iowa. Holte-Mancera hit .385 with seven home runs and a .515 on-base percentage there last season and has the ability to play the outfield and behind the dish. He is a versatile player who has thrived at getting on base in his college career. Irvine is another Junior College star who played the last two seasons at Northern Essex Community College in Massachusetts. He hit .342 there in 2018 and was named an NJCAA Division-III Second-Team All-American. He’s another left-handed hitter who always shows good speed. Shahidi is another top junior college hitter who spent the last two seasons at Iowa Lakes Community College. He hit .336 with a .445 on-base percentage and 10 home runs in 51 games last season and brings the Terps another good defensive catcher who can also handle the bat. Maryland had some exciting moments in 2018, from clutch home runs, to defensive web gems and fantastic individual performances. With the season quickly approaching, Maryland baseball held its media day on Monday, giving head coach Rob Vaughn and senior pitcher Hunter Parsons a chance to talk about the upcoming campaign. Vaughn and Parsons touched on a multitude of topics, but here are the five most important things we learned about the 2019 Maryland baseball team at media day. Parsons is set in stone as Maryland’s Friday night starter, but the other spots still seem to be up for grabs. However, Vaughn said that Thompson has impressed so far this spring. Thompson is a redshirt sophomore right-hander who sat out last season after transferring from St. Mary’s College of Maryland, a Division III school. According to Vaughn, Thompson struck out eight batters in three innings in an intraquad scrimmage last week, and he’s now making a strong case for the open Saturday spot. The head coach was also very impressed with O’Connor, a freshman who joined the team as a walk-on in the fall, and has maybe been the biggest surprise for the Terps so far. Blohm posted a 4.10 ERA and 54 strikeouts in 59 innings over 11 starts. He was dominant at times, including a 12-strikeout performance against Stetson. But Blohm struggled with injury down the stretch, and that same injury followed him into the spring. Vaughn said Blohm recently got back on the mound, but he most likely won’t be ready for the opening weekend at Coastal Carolina. However, he is still a part of the rotation plans. The same goes for redshirt freshman left-hander Drew Wilden, who missed last season after Tommy John surgery. Wilden was one of Maryland’s top recruits when he arrived in College Park, and Vaughn knows what he can bring to the team. Vaughn said Wilden finally got back to the mound this week, a great sign for Maryland’s rotation. After the departure of stars Nick Dunn (2B) and Kevin Biondic (1B), the Terps have two holes on the right side of the infield this season. Sophomores Tommy Gardiner and Michael Pineiro will get their shots, but according to Vaughn, freshmen Ben Cowles and Kody Milton have really impressed so far this spring. Cowles was one of the best infield recruits out of New York, and although shortstop is his natural position, he has shown the tools to get himself into the lineup at second base. Milton, the son of former Maryland star Eric Milton, was the No. 1 first base recruit in Maryland, according to Perfect Game, and has shown what he can do with the bat. Vaughn said freshman Josh Maguire will also get a look at that open second base position, as he has plenty of options in the infield. The Terps lost basically their entire starting outfield from last season, with Will Watson and Zach Jancarski graduating and Marty Costes leaving for the MLB Draft. Randy Bednar, who hit .208 in 43 games last season, will return to a starting spot in the outfield, but Vaughn said Bednar is the only player who has locked down an outfield spot. Vaughn mentioned multiple other names, including Chris Alleyne, who spent his summer and fall converting to the outfield, and Sebastian Holte-Mancera and Caleb Walls, two junior college transfers. The head coach also talked about Pineiro, who came in as a first baseman, but also got plenty of reps in the outfield in the fall. Maryland has obviously worked on a lot in the fall and spring after a disappointing 24-30 record in 2018. However, the Terps also did a lot of work in the classroom. Vaughn explained how the team focused a lot on mindset and leadership, which had an impact on many of his players, especially his ace. The Terps had several big offensive days in 2018, but none bigger than May 12, when the Terps put up 17 runs in a blowout victory over Rutgers. The day was special for the entire Terrapins offense, with nine different players getting at least one hit. But specifically, senior outfielder Will Watson had one of the best performances in college baseball history. Watson came to the plate for the first time in the first inning. Maryland already had a 1-0 lead, and with runners on the corners and one out, Watson added to that lead with a sacrifice fly to center field. With the Terps up 2-1 in the third, he came to plate again with runners on the corners and one away. But this time, Watson got into one. His three-run home run opened up a four-run Maryland lead. The Terps continued to pour it on in that same 11-run third inning. Watson came to the plate again in the frame, this time with Maryland leading 9-1 and the bases loaded with two down. The senior delivered again with another laser shot out to left field — this one a grand slam — giving the Terps a 13-1 lead. WILL WATSON ARE YOU SERIOUS?? In that inning alone, Watson went 2-for-2 with two home runs and seven RBI. The seven RBI in a single inning tied him for second all-time in Division I college baseball history, and the two home runs in the same inning tied the all-time record. Watson finished the day 3-for-5 with two home runs, eight RBI, a single and two runs scored. The eight runs batted in tied the all-time Maryland record. Two 2018 Terps were selected in the 2018 MLB and two more have since signed professional baseball contracts, as the number of Maryland baseball players in the pros continues to grow. Here’s a look at how all of those guys are performing during the 2018 season. While more Terps should make it to the show soon, Cecil is still the only former Terrapin in Major League Baseball. Cecil, who turned 32 on July 2, is in his 10th big league season, and his second with the Cardinals. He missed a chunk of the 2018 season with an injury, but has been solid since returning to the mound, posting a 4.00 ERA with 11 strikeouts over 18 innings of work. However, Cecil’s walk rate is currently the highest of his career, and because of that has not been used in many high-leverage situations. After seven seasons in the minors, Adam Kolarek made his major league debut last June, and worked in 12 games for the Rays in 2017. This season, Kolarek has not yet gotten the call-up, but has been absolutely filthy in Durham. The lefty has posted a 1.09 ERA over 41.1 innings this season, and his 10.89 K/9 is the best mark of his career since he got to the Triple-A level. With only nine walks and five earned runs allowed in the entire season, it shouldn’t be long before Kolarek gets another chance with the big club. After again dominating at the Double-A level this season, Brandon Lowe finally got the call-up to Durham on June 7. Since then, Lowe has been on fire. He is hitting .341 with a 1.147 OPS at the Triple-A level and has eight home runs. Those eight long balls came in a 10-game span from June 21 to June 29 and led Lowe to be named Minor League Player of the Week on June 25. Lowe’s ridiculous stats in June have but him on the major league radar. LaMonte Wade, like Lowe, was again tearing it up at Double-A this season, and just two days after Lowe got his call-up to Triple-A, Wade got his as well. The bat hasn’t been quite as hot for Wade, but he has continued to do what he has done at every level — get on base. Through 22 games with Rochester, Wade is hitting .250, but is sporting a .397 on-base percentage as he has drawn 17 walks and struck out only 11 times. The power is also starting to come along for Wade, who has already matched a minor league career-high with nine overall home runs in 2018. WATCH: LaMonte Wade launched this 3-run home run for the @RocRedWings in game one of yesterday’s doubleheader which proved to be the difference. In his first year at the Double-A level, Mike Shawaryn may be putting together his best minor league season. Through 15 starts this season, Shawaryn has posted a 3.55 ERA with 77 strikeouts and only 22 walks in 88.2 innings of work. While his strikeouts are down from last season at Single-A, his walks, home runs, and batting average against are down, as well, as Shawaryn continues to find ways to get guys out. As the Red Sox No. 9 overall prospect according to MLB.com, The Unicorn could be on his way to the big leagues, or possibly the centerpiece of a deal at the trade deadline. After fighting his way back from injury in 2017, Jake Stinnett is in his first full Double-A season with the Smokies this year. Stinett has made a full-time transition to the bullpen since the injury, and has found success there this season. In 32 innings of work, he has pitched to a 4.78 ERA with 38 strikeouts and just 14 walks. In this new role, Stinnett has the best strikeout rate of his career, and has recently been moved into the closer role for the Smokies. Since then, he has converted four saves in a row, and has struck out four batters without allowing a baserunner in those four innings since June 26. Kevin Smith starting the season in Single-A Lansing, but quickly proved that his bat was due for a promotion. After hitting .355 in 46 games for the Lugnuts, Smith was promoted to High-A Dunedin on May 28. Since then he has continued to swing a hot bat, batting .301 with six home runs in 29 games at the High-A level. After another strong week for Smith in Dunedin in which he batted .414, he was named the Florida State League Player of the Week on July 1. Now the No. 18-ranked prospect in the Blue Jays system according to MLB.com, Smith could earn himself another promotion soon. Alex Robinson battled injuries early in the 2018 season, but has finally made it back to the mound consistently here lately. In 17.2 innings at Fort Myers this season, Robinson has a 3.57 ERA and has struck out 20 batters compared to just 10 walks. Opponents are batting only .206 against the power lefty this season, and Robinson’s last appearance may have been his best of the year. He worked 2.1 scoreless frames while striking out three batters. Brian Shaffer’s first season at full-season Single-A has been a dominant one. Over 15 starts this season, Shaffer has worked 84.2 innings and has posted a 2.98 ERA. And the righty has continued to do exactly what he did in College Park — throw strikes. Shaffer has 86 strikeouts on the year and has walked on 18 batters. In his last four starts dating back to June 12, he has 28 strikeouts and has not walked a batter over 25 innings. After being drafted by the Houston Astros for the second straight year, this time in the 22nd round, Marty Costes decided to sign his first pro contract. He started the season in short-season Single-A, where his first professional hit was a triple, but played only four games there before getting the call-up to full season ball on June 24. Since the promotion, Costes is hitting .235 with an RBI and is currently on a three-game hitting streak. Jose Cuas spent his entire college career and his first three minor league seasons as an infielders, but he decided to transfer to the rubber in 2018. His first 12 appearances on the mound have been rough this year, however. He has a 9.92 ERA in 16.1 innings, but has recorded 16 strikeouts in that time. After an incredible junior season at Maryland, Nick Dunn was drafted by the Cardinals in the fifth round of the 2018 MLB Draft and signed with St. Louis. Dunn has started his career at the short-season Single-A level, and has continued to hit the baseball. Through 15 games, Dunn is hitting .302 with eight RBI and has more walks (9) than strikeouts (8). And he had an incredible start to July, going 5-for-9 in his first two games of the month. After spending all of 2017 in rookie ball, Jamal Wade started 2018 on the disabled list, but he returned on June 14 and was promoted to short-season Single-A. Wade has appeared six times out of the bullpen this season for the AquaSox and has a 1.82 ERA. In 10 innings of work he has allowed just two earned runs on five hits while striking out nine batters and walking only two. In his most recent appearance on July 2, Wade recorded his first save of the season, working a rare three-pitch inning to shut the door. Kevin Biondic was not selected in this year’s draft after his final season at Maryland, but on June 21, the Boston Red Sox took a chance on Biondic, signing him as a pitcher. Biondic made his pro debut on July 1, allowing just one run on one hit and recording a strikeout in two innings of relief. In second pro season, Ryan Selmer started the year at High-A with the St. Lucie Mets, but was sent to Brooklyn after just two appearances. Selmer has appeared seven times at short-season Single-A this season and has an 8.38 ERA with one save. Jake Drossner has struggled with injury over the past two years, and will most likely miss the entire 2018 season. He last pitched for Single-A Wisconsin last season, making one start and going four innings after pitching 94 innings there in 2016. After an incredible four-year career at Maryland, Taylor Bloom was not selected in the MLB Draft, but he will get a chance at a pro career. On June 30 Bloom signed a contract with the Washington Wild Things, and independent team in Washington, Pennsylvania that plays in the Frontier League. Bloom started for the Wild Things on the same night he was signed, and allowed four runs on six hits and struck out four over five innings. Maryland held it’s spring sports media day on Tuesday, which gave Terps Head Coach Rob Vaughn his first chance to meet with the media before the start of the 2018 season. Vaughn revealed a lot about his roster and his plans for the year, and we’ve narrowed it down to the six most important things we learned about the Terps on media day. Hunter Parsons posted a 3.50 ERA and 1.11 WHIP in a freshman season that included five starts and 10 relief appearances. However, last season the success just wasn’t there. Parsons started the year as the Terps midweek starter, but quickly lost that role after three consecutive rough outings. The righty finished the year with a 12.05 ERA and 2.31 WHIP in 21 2/3 innings. Despite a tough 2017, Coach Vaughn is sticking with Parsons, and said Tuesday that he will start on the first Sunday of the season against Tennessee. Parson’s 2017 numbers may have looked bad on the surface, but a deeper dive shows that he may have actually improved in some areas. His walk rate went virtually unchanged from 2016 to 2017, and his K/9 actually improved significantly from 7.00 to 9.97. The loss of Kevin Smith in the MLB Draft left a gaping hole at shortstop for the Terps. However, the easy move was to move AJ Lee over from third base. Lee hit .307 with an .863 OPS last season and will be moving back to his natural position in 2018. The Terps had a few options at third base, including junior college transfer Brad Barnett and senior Kevin Biondic, but Vaughn ultimately chose Taylor Wright, the junior transfer from Colorado Northwestern Community College. “[Taylor’s] going to be a middle-of-the-order impact bat for us,” Vaughn said. Zach Jancarski was arguably the Big Ten’s best leadoff hitter last season. As a junior, Jancarski played in all but three games out of the top spot in the order, slashing .325/.424/.887 with 22 extra-base hits and the same amount of walks (33) as strikeouts. However, the now-senior may not be back in that lineup spot to start the season. On the January 27th edition of the Maryland Baseball Network Podcast, Chris Webb of 10innings.com told us that Marty Costes would be hitting leadoff for the Terps. On Tuesday, Coach Vaughn would not specifically who would dig in to start the game against Tennessee on Feb. 16, but he did say that Costes and Jancarski would be the first two batters in the order. Costes actually had a better on-base percentage (.429) than Jancarski last season and led the team in home runs with 13. Maryland had steered away from naming an actual closer over the past two seasons, but Coach Vaughn did just that on Tuesday. Murphy pitched to a 1.27 ERA and struck out 27 batters while walking just eight in 31 2/3 innings for the Terps last season. However, he really showed his worth in the postseason, when he struck out 12 batters in nine innings and worked out of two almost-impossible jams. Despite all the success, Murphy did have only one save last season, so this will be a brand new role for the junior right-hander. While Costes and Jancarski have left and center field locked down, the third outfield spot may still be up for grabs in College Park. It looks like the Terps’ top two options right now are freshman — Randy Bednar and Richie Schiekofer. Bednar was the No. 5-ranked player in Maryland in the class of 2017, according to Perfect Game. The right-handed hitter batted .327 with six home runs for the Baltimore Redbirds in the Cal Ripken Collegiate Baseball League this summer. Schiekofer was the No. 7-ranked outfielder in New Jersey coming out of high school, according to Perfect Game. He hit .306 from the left side for the Silver Spring-Takoma Thunderbolts of the CRCBL this summer. The Terps used six different midweek starters in 2017, never really committing to one midweek option, and it looks like Maryland could do the same thing this season. Coach Vaughn said he doesn’t want to get bogged down with pitchers’ roles, and instead just wants to focus on how he can win games and move on to the next. However, if there is a midweek starter at the moment, it’s freshman right-hander Mark DiLuia, according to Vaughn. We could see DiLuia get the start on Feb. 21 at William & Mary — Maryland’s first midweek game of the season. DiLuia was the No. 38-ranked player in Illinois in the class of 2017, according to Perfect Game, and was taken in the 38th round of the 2017 MLB Draft by the Texas Rangers. Adam Kolarek made his major league debut back in June with the Tampa Rays, but was then sent down after a few weeks with the big club. However, thanks to September roster expansion, Kolarek earned a trip back to the bigs — doubling the MLB Maryland representation. That and more in this edition of the Pro Terps Update. Brett Cecil has been the only staple in the big leagues for the Terps for several years now, and his first season with the Cardinals has been a rollercoaster. After a dominant June and a solid July, Cecil was ineffective in August. In 13 innings last month, the lefty allowed 10 earned runs and a .321 batting average against him. However, Cecil’s 19 strikeouts and two walks in August was by far his best monthly ratio of the season. His 6.92 ERA in the month could be explained by his incredibly unlucky .472 BABIP. Cecil is sporting a 4.15 ERA and 1.38 WHIP with 54 strikeouts over 56.1 innings this season and will still be an important piece for the Cardinals down the stretch in their push for an NL Wild Card spot. After making his major league debut June 29, Adam Kolarek was sent back to the minors in late July after making 11 appearances with the Rays. Back in Triple-A, the former Terps allowed only three earned runs and struck out 17 over 10.2 innings with the Durham Bulls, which earned him a September call-up with the Rays. Kolarek appeared in only one game after being recalled — he allowed one run on two hits and walked one while recording two outs against the White Sox September 3. The 28-year-old lefty has been dominant in Triple-A (1.65 ERA, 9.48 K/9), but his major league stats haven’t been great this season (6.48 ERA, 4.32 K/9). Because of that, Tampa Bay outrighted Kolarek back to Durham on September 4. LaMonte Wade put together an all-star campaign for the Lookouts this season, who were co-Southern League Champions after Hurricane Irma prevented them from playing their championship series against the Pensecola Blue Wahoos. He finished the season hitting .292 with seven home runs and 67 RBI and ended up with more walks (76) than strikeouts (71). Wade’s .397 on-base percentage was good for third-best in the Southern League, and he was a key park of Chattanooga’s semifinal series victory. The 23-year-old outfielder hit .278 in the five-game series, with his most important knock coming in the ninth inning of game five. With the Lookouts trailing the Montgomery Biscuits 2-1 in the bottom of the ninth, Wade led off the frame with a single and came around to score when Jonathan Rodriguez ended the game with a walk-off two-run dinger. Wade, who is the Twins No. 17 overall prospect, will now head to the Arizona Fall League to play with the Surprise Saguaros so the Twins can get another look at him before Spring Training. And he already has something in common with one of his coaches. It was an all-Terps matchup in the Southern League semifinals, but Wade’s team got the better of Brandon Lowe’s. However, Lowe still had an incredible season. After hitting .311 with a .927 OPS in High-A, Lowe was promoted to Double-A. He hit only .253 in 24 games with Montgomery, but his performance in High-A earned him Florida State League Player of the Year honors. Lowe went 0-for-7 in the playoffs with the Biscuits, but he should be on track to start at second base for Tampa Bay’s Double-A affiliate next season. He will also have a ranking bump from MLB.com going into 2018. Since coming off the disabled list and being promoted to Double-A on August 5, Jake Stinnett has been almost unhittable out of the Smokies bullpen. He has allowed just one earned run and struck out 14 batters over 14.2 innings. Over his entire 2017 minor league season, Stinnett posted a 1.19 ERA and 1.01 WHIP. Like Wade, Stinnett will also get his chance to further show off his talents in the Arizona Fall League. The Unicorn ended the season in strong form and as the Red Sox No. 7 overall prospect. Mike Shawaryn finished his 2017 season between Single-A and High-A with a 3.81 ERA and 11.29 K/9 in 26 total starts. The 22-year-old righty also ended his season with two of the best starts of his career. Shawaryn struck out 18 batters and walked only two while allowing just two earned over his final 14 innings of the year, including a career-high eight innings on August 27. Alex Robinson was finally able to find his control this season, posting a 2.84 ERA and 1.16 in A-Ball, which earned him a call-up to High-A back in July. In 17.1 innings with the Fort Myers Miracle, Robinson posted a 4.67 ERA and 1.56 WHIP. He finished his full minor league season with a 1.28 WHIP and an impressive 12.69 K/9. It was again a struggle at the plate for Jose Cuas in 2017. The 23-year-old hit just .187 with a .598 OPS and five home runs this season. Cuas moved around the infield defensively and spent a lot of time at first base despite playing third base at Maryland. However, the former Terp did heat up a little at the end of the season, hitting .258 with four RBI over his final eight games. Since being promoted to Low-A in July, Brian Shaffer has been dominant. In 21 innings, the tall righty struck out 21 batters and walked just one. In 24 innings overall in his first minor league season, Shaffer pitched to 3.38 ERA and 0.83 WHIP while holding opposing hitters to a .211 batting average. Shaffer, who is Arizona’s No. 30 overall prospect, was used as a starter, but only for two or three innings at a time. The short outing helped to limit his usage and increase his productivity while getting Shaffer ready to be a full-time starter next season. Kevin Smith, who is ranked as the Blue Jays No. 25 overall prospect, was Maryland’s highest 2017 draft pick (4th round), and he lived up to the hype in his first season. Smith hit .271 with a .778 OPS in 61 games, leading Bluefield with 25 doubles, eight homers and 43 RBIs. He was able to show off his power on August 31. However, the plate discipline was still a bit of an issue for the former Terp, who struck out 70 times and drew only 16 walks. Ryan Selmer finished up his first professional season with some impressive numbers. The 23-year-old righty pitched to a 2.14 ERA over 21 innings and converted both of save opportunities. In classic Ryan Selmer fashion, the reliever threw almost double as many ground balls as fly balls, which helped overcome 1.52 WHIP and .284 batting average against. Over his 14 appearances, Selmer allowed an earned run in only three of them. The younger Wade was drafted in the 17th round in June, but performed like an early-round draft pick in his first professional season. Over 19.2 innings, Wade posted a 1.83 ERA and 0.92 WHIP while striking out 27 batters and walking only seven.